The Philadelphia Flyers’ season still has a few weeks left before it can mercifully come to a conclusion; for the next wave of future Flyers, their respective offseason’s, and for some, their postseason schedules, have already begun. The Flyers’ prospect cupboard has had its fair share of talent over the past few seasons thanks to the strong drafting by Ron Hextall and co. Even in the wake of his departure, the Flyers have a slew of young, promising up-and-comers looking to carve their path to the NHL. Without further adieu, let’s take a look at some of these prospects, and how their season’s have gone. Flyers fans will be excited to know that 2018 first-round pick Joel Farabee has signed his entry-level contract (ELC) after a very successful freshman season with the Boston University Terriers. Farabee will compete for a roster spot with the Flyers this upcoming season and would be a welcome addition to the roster if he shines in training camp. Farabee, 19 years old, led the Terriers in goals (17) and points (36) this season, while also chipping in 19 assists in 37 games. He excelled on both special-teams units, scoring five power play goals and three shorthanded goals on the season. Unfortunately for Farabee and the Terriers, their season ended in the semifinals of the Hockey East Championship while Farabee was sidelined by an injury. With the Terriers season over, he will rehab from his injury with the Lehigh Valley Phantoms, and be eligible to suit up for the Phantoms in the Calder Cup Playoffs, as long as his injury doesn’t prevent it. Flyers fans should be clamoring for this young man’s arrival; his skillset is tailor-made to help shore up the Flyers forward corp. Farabee’s deadly accurate wrist shot, relentless tenacity chasing the puck, and ability to effectively kill penalties, which includes being a threat to score shorthanded, make him a unique talent the Flyers could certainly use in their lineup. Morgan Frost, a 2017 first-round pick, continues to run rampant through the OHL, finishing his regular season with 37 goals and 72 assists, for a whopping total of 109 points in 58 games. Frost has been at or near the top of the OHL leaderboards from wire-to-wire, contributing to the Sault Ste. Marie Greyhounds earning the third seed in the western conference of the OHL Playoffs. 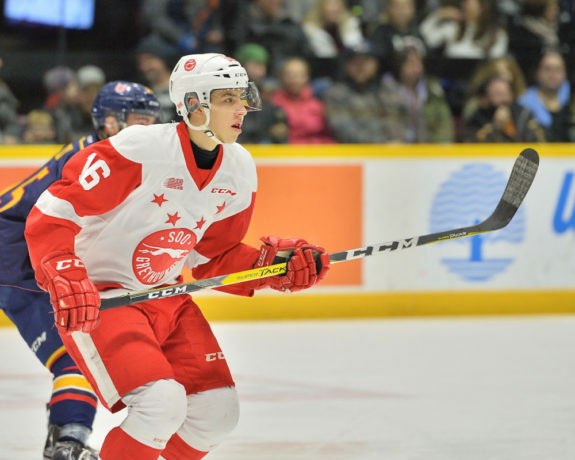 Frost and the Greyhounds will collide with fellow Flyers prospect Maksim Sushko and the Owen Sound Attack in the opening round. Frost’s gaudy point totals this season are cause enough for excitement, but an OHL championship and Memorial Cup playoff berth would just be icing on the cake for this electric prospect, if he can will his team to it. Frost will turn 20 and graduate from the OHL at the conclusion of this season and begin his professional career. 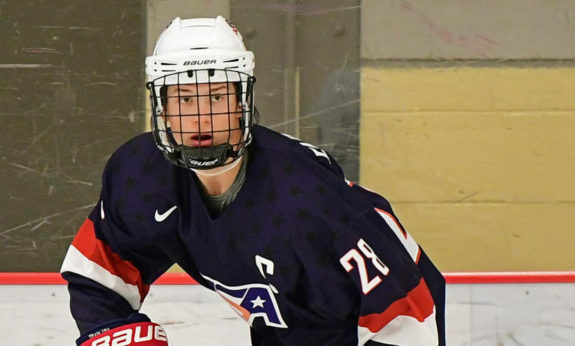 Expect to see Frost and Farabee duke it out in a camp battle you won’t want to miss that may end with only one of these talented forwards cracking the lineup. Isaac Ratcliffe, the physically imposing 6-foot-6 forward, has taken a solid leap in his development this season. In his final OHL campaign, he scored 50 goals and 82 points in 65 games, while also serving as captain of the Guelph Storm. Ratcliffe’s 50 goals, 12 of which came courtesy of the power play, tied for fifth-most in the OHL this season. The Storm have qualified for the OHL Playoffs as a four seed, and if they go on a deep run, Ratcliffe will almost certainly be a major factor in their success. Like Frost and Farabee, Ratcliffe will also begin his professional career next season, but will start the season with Lehigh Valley barring a monster training camp. Seasoning in the AHL won’t be the worst thing for Ratcliffe, who still hasn’t filled out his massive frame, or fully learned how to utilize it. If he continues to progress, he has the chance to turn into a big, mean, goal-scoring machine for the Flyers. Hextall may have left the Flyers with one last parting gift by finding another undrafted diamond in the rough. Egor Zamula, a development camp invite who earned himself an ELC with the Flyers, ala Philippe Myers, has lit up the WHL this season playing for the Calgary Hitmen. The 6-foot-3 lanky defenseman still has plenty of room for growth, and another year of eligibility in the WHL before he turns pro. If he can follow the same path as Myers, the Flyers will have another skilled, puck-moving blueliner, compliments of Hextall. Wade Allison’s injury-marred junior season at Western Michigan University has come to a close. Allison finished the season with 15 points in 22 games, including eight goals. The man Hextall coined a “big red train” could forego his senior season to sign his ELC this summer. Defenseman Wyatt Kalynuk presumably will be returning to the University of Wisconsin-Madison for his junior season after being named captain for the 2019-20 season. Kalynuk finished his sophomore season with 25 points in 37 games. Freshman forward Noah Cates will participate in the Frozen Four NCAA Championships with the University of Minnesota-Duluth Bulldogs. Cates posted 22 points in 36 games this season for the one-seed Bulldogs.